£12.99 on the website as well so must be national... Stock up for Christmas!! hard to find anything decent now a days below £15!! Never mind Xmas, I'll be getting some for the weekend. Cheers. I'm going to buy a bottle, cigars and stick some blues on. This price in the London Kilburn branch on Saturday. Penny more at ASDA is that is nearer. I suspect the clever shoppers will probably get it cheaper with the ASDA price guarantee thing by adding some cheap aditional items, I guess you can get it for 10% less than the Tesco price of £13.50. Same price in Widnes Aldi too, must be national. Was £13 in Asda (yesterday at least) if that's easier for anybody. edit: Sorry, just noticed somebody else has posted the same. just got a litre bottle for 14 euros but that is duty free shopping for you. Is this nicer than jack daniels never had jim beam. Better than JD, not as sickly. Allegedly the own brand 'Kirkland Signature' 7 year old premium small batch bourbon is made for them by Jim Beam, £38 for a litre. This is at first glance expensive, but it is 51.5% by volume ! But Kirkland I'd Costco so not Aldi. If you want Jim Beam at its best try Jim Beam Black. Superb. And if you are going to drown your bourbon in coke then this is ideal. 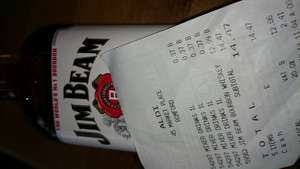 Bourbon from Aldi / Lidl in Portugal costs less than £5 - surely we do not pay that much tax in the UK? But Kirkland I'd Costco so not Aldi.If you want Jim Beam at its best try … But Kirkland I'd Costco so not Aldi.If you want Jim Beam at its best try Jim Beam Black. Superb. oh come on black label is far from the best. Devil's Cut, single barrel, white label 7 year, bookers, bakers, knob creek? oh come on black label is far from the best. Devil's Cut, single barrel, … oh come on black label is far from the best. Devil's Cut, single barrel, white label 7 year, bookers, bakers, knob creek? Do any of the supermarkers stock those brands? Still expensive.Bourbon from Aldi / Lidl in Portugal costs less than £5 - … Still expensive.Bourbon from Aldi / Lidl in Portugal costs less than £5 - surely we do not pay that much tax in the UK? Yes we do. Tobacco is worse. We pay £6 more per pack! Tesco has knob creek and devil's cut. (they also have red stag, maple, and honey). I like Jim Beam Black. My absolute favourite, though technically not a bourbon, is Bushmills Black Bush, matured in Jack Daniels casks. Hey, even the cheap Lidl bourbon is easy to drink. I like Jim Beam Black. My absolute favourite, though technically not a … I like Jim Beam Black. My absolute favourite, though technically not a bourbon, is Bushmills Black Bush, matured in Jack Daniels casks.Hey, even the cheap Lidl bourbon is easy to drink. ok well I challenge you to try either bookers, bakers, knob creek or devil's cut and tell me it doesn't beat the black label. Don't get me wrong, black label IS a good product, I drink it myself - but it's not the best beam, not by a long shot. ok well I challenge you to try either bookers, bakers, knob creek or … ok well I challenge you to try either bookers, bakers, knob creek or devil's cut and tell me it doesn't beat the black label.Don't get me wrong, black label IS a good product, I drink it myself - but it's not the best beam, not by a long shot. Wheres the best place to buy these - I don't shop in tesco as they are money grabbing liars - so any other supermarket? Wheres the best place to buy these - I don't shop in tesco as they are … Wheres the best place to buy these - I don't shop in tesco as they are money grabbing liars - so any other supermarket? I only shop at Tesco and Waitrose - I'm pretty sure waitrose has knob creek, others like bookers you need to go to a specialty store (careful with this one, it's 63% alc). So this has gone to nearly 400 degrees for a saving of only 1p over Asda and only 51p over Tesco / Ocado. Just shows how manipulated this site is. So this has gone to nearly 400 degrees for a saving of only 1p over Asda … So this has gone to nearly 400 degrees for a saving of only 1p over Asda and only 51p over Tesco / Ocado. Just shows how manipulated this site is. When I put it on the others hadn't reduced their prices so it got hot before i think.